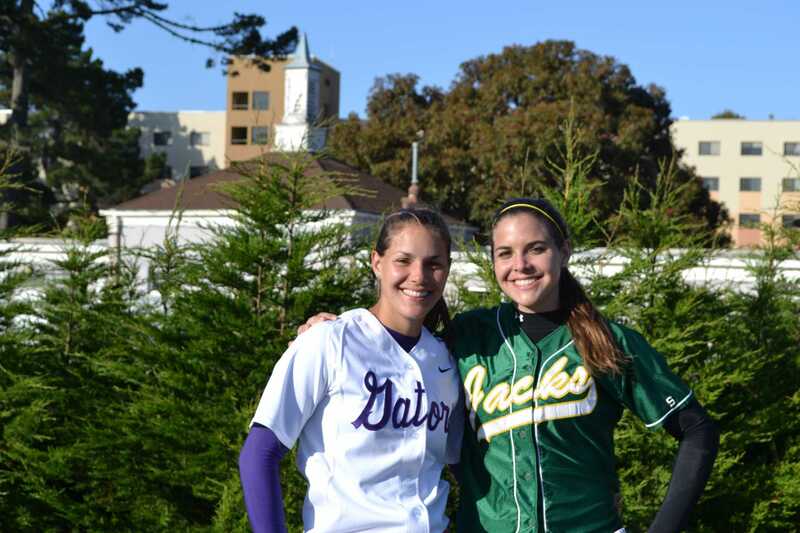 For the first time in their entire lives, identical twin sisters Jenny and Katie Obbema went head to head, pitching for opposite teams at Humboldt State over the weekend: Jenny for SF State, and Katie for Humboldt. At first, they both planned to attend SF State, but for Katie Humboldt State suddenly became an option, and everything fell into place last minute. “We’ve always been each other’s best friends, always had the same group of friends and did everything together,” Katie said. When they left to go to different colleges last year, it was the first time since birth that the twins were apart for longer than a single day. The Obbema’s have always been an athletic family. Their mother played softball growing up and their father played football at UCLA. The twins found their passion for softball during their early T-ball days, following in their mother’s footsteps. The sisters’ competitive side really came out when they both got on the mound, this time for opposing sides. As for their parents, they’re not exactly sure what to do about their daughters pitching for different teams now. “Last year, my parents cut two shirts down the middle with our school colors, then sewed them back together,” Jenny said. The shirts were half Humboldt, half SF State. But Katie said her parents were definitely quiet during this game. For the game he sported a neutral, gray sweatshirt. He said he was so nervous that he kept a bottle of Tums nearby to ease his stomach at every inning. “I never get a break. First one daughter is up there pitching, then the other,” he said. “I’m always on edge — I want them to do well. But he got through it without any ulcers — yet. “We’ve still got two more years of this. I’ll go buy stock from whoever owns Tums because I’ll be buying a bunch of those in the years to come,” Rick said. So far, the sisters have figured out how to make the distance between them work and they said they are seeing each other as much as they can.